Old Town of Lijiang, a little city in Yunnan Province, is included in the UNESCO’s World Heritage List. 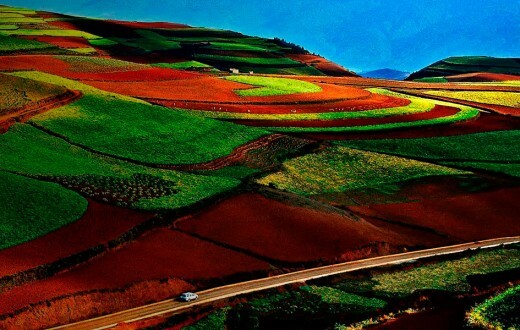 It is famous for its orderly system of waterways and bridges and the Naxi people, the main ethnic group, has retained traditions and customs. This ancient city was built 800 years ago entirely with earth and wood without any nails. At the foot of a snowcapped mountain lies this city, where rivers flow freely through the city in front of wooden folk houses. For nearly a thousand years, the slow footsteps of time are accompanied by the sound of flowing water here. This city has a population of 25,000, covers less than four square kilometers, but is included in the World Heritage List together with world famous cities like Athens, Rome and Venice. We will bring you to the Old Town of Lijiang, the ancient city in northwest Yunnan Province, China. Water sources and flowers in every household in the ancient town of Lijiang. In the southeast corner of the Old Town of Lijiang. is an old pomegranate tree, by which three stone wells of different heights stood. A spring gushes out near the roots of the tree to fill the wells. An old lady, wearing a waistcoat with an apron over her gown, stood by the first well, gently scooped up some water and filled the bucket she held with ease, lifted her shoulder pole and headed down the lane … For the past several decades, this scene is played every morning. This old lady, Mrs. He, is a Naxi native in Old Town of Lijiang.. “He” is a very special family name, but it is one of the major surnames in Lijiang. The three wells beside the tree are called “Pomegranate Wells”. They are one of the famous “Three Pit Wells” found here. With heights going from high to low, they are used separately for drinking, washing vegetables and laundry respectively. With its continuous water flow, the water is always clean and clear in all four seasons. Some locals will put gourd ladles near the wells for travelers to get drinking water. “Tap water is available in my home, but it’s not as sweet as the water from the well here,” said Mrs. He. Water is the life blood of Lijiang. The river flows into the city from its northwest corner, branching into three courses, namely western, central and eastern, as they flow into the Old Town of Lijiang. Each course will break into another three more branches, and then further from three to nine, to eventually form the water system that goes around the whole city so that streams of water will flow in front of every household.. He only loves and cares about gardening,” Grandma joked as she laid down the shoulder pole and buckets. “Well, didn’t you ask me to do housework all the time?” Grandfather laughed. 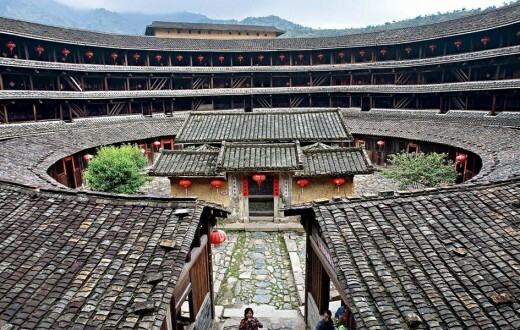 Naxi, the main ethnic group in Old Town of Lijiang, has retained some traditions and customs of a matriarchal society. Naxi women not only do the housework, but also have to earn money to support their families. 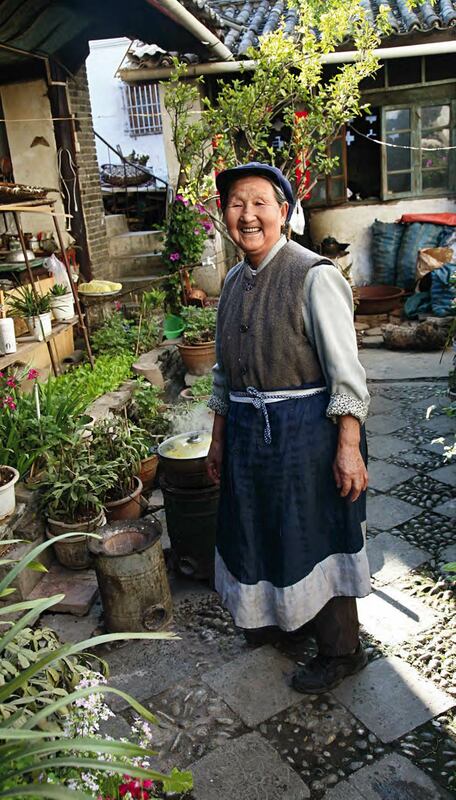 In this ancient city, it is common to see other Naxi women working like Grandma He. Grandmother He really misses those days before the city was developed: “At that time, neighbors were as intimate as family members.  On occasions such as weddings, funerals and other family events, we would help each other to take care of things”. In the 1980s, the city started to develop tourism, which has promoted economic growth but at the same time, it has changed the lives of local people.” Most of my neighbors have moved to the new city, and places around here have been turned into inns. But when you are in need, you just have to make a phone call and they will be back.” said Grandma. Different from many other Chinese ancient cities, there are no walls around Old Town of Lijiang. Busy with traffic, the surrounding ring roads separated the ancient city from the new city, but connected the old with the modern. Standing on the panoramic tower of Wangu Building in the west, we overlooked this ancient city. High and low houses with grey tiles merged together to form into one large piece that looks like an armor covering every inch of the land. East Avenue, in the northern part of the city, is the widest commercial street. Visitors will generally use this street to go into the city. After passing by a large waterwheel and walking southward for another ten minutes, they will reach the heart of the ancient city – Sifang Street. This street is actually a square where bars, tea houses, restaurants, handicrafts shops congregate, thus attracting crowds of visitors. 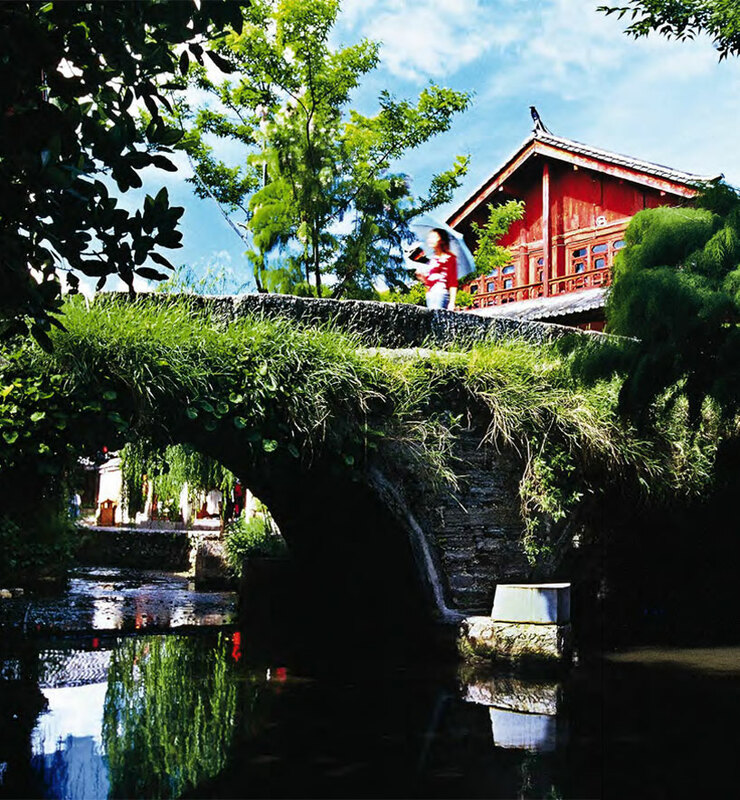 Using Sifang Street as the starting point, if you head east, you will find the famous Big Stone Bridge. This is a two-hole arch bridge built in the Ming Dynasty. 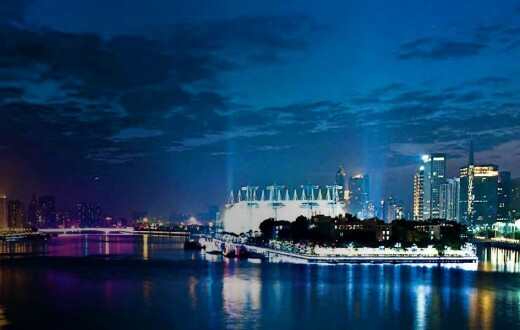 It connects Sifang Street with two main roads, namely Mishi Lane and Wuyi Street. These main roads are filled with shops that extend into the countless alleys, which lead into the surrounding areas. 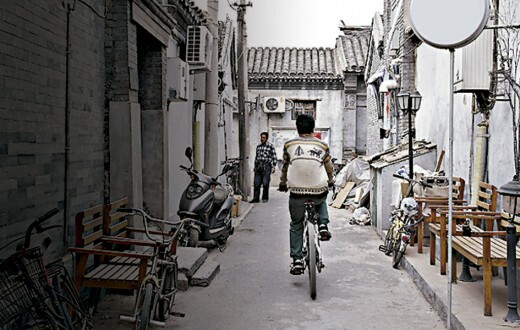 To the south is a city gate called Guanmenkou, which in ancient times is said to be the boundary between the dignitaries living inside and the poor outside. Today, it is a place where you can find various snacks. If you go further, you will see Qiyi Street, where stores selling unique local costumes and clothing, scarves, wind chimes and other goods line both sides of the street. Passing through a bustling and thriving area, we come to a residential area. This is where Wang Hui’s inn is located. The greatest charm of Lijiang is that people here can often open their hearts to others and strangers could become friends. Wang Hui is Grandmother He’s new neighbor. As a native of Beijing, she fell in love with Old Town of Lijiang in 2006 when she visited the city for the first time. “I came here almost every year since then, and in 2009 I quitted my job and decided to live here”. Among the most visited tourist destinations selected by Chinese televisions, newspapers, websites and other leading media, Old Town of Lijiang is definitely an undoubted choice. Every year, four to five million tourists come here for a visit. In the last ten years, the number of permanent residents of this city has increased at an average rate of 2.56% annually, which is much higher than the national rate of 0.57%. Many of them are new Lijiang people like Wang Hui. Why is this small city so attractive? “When I first came here, I set out from the old city and toured the splendid places nearby. I climbed the Yulong Snow Mountain, visited the wetlands around Lashihai Lake and went on a hike in the Tiger Leaping Gorge. Later, I watched the folk music and dance performances in the ancient city, studied the wooden architecture, and became strongly interested in the ethnic culture; then, I went nowhere but just stayed in the inn, where a group of tour pals from different places chatted and laughed together. 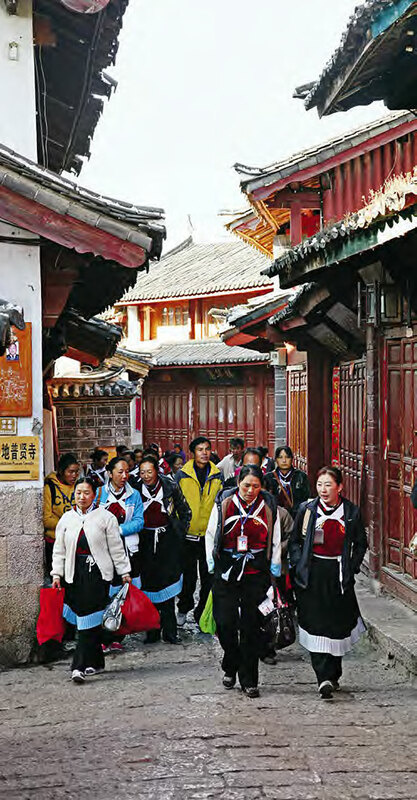 By then I realized that the greatest charm of Old Town of Lijiang is that people here can often open their hearts to others and strangers could become friends.” said Wang Hui. In this ancient city, you will get warm responses from any passers-by that you greet. “Some people are relatively shy when they first arrived here, but they will be influenced by the atmosphere after staying a few days, and will offer to be tour guides for new arrivals.” Happiness spreads out to form an easy atmosphere in this ancient city. Locals like Grandmother He often invite curious visitors to their homes to chat about life here. To tour around the city, one does not require an itinerary. You can shop along the main roads, or make a special “exploration” by travelling in the alleys. 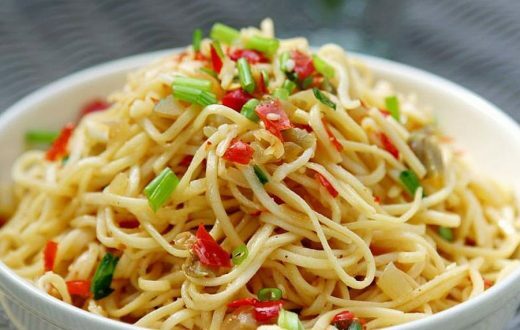 It will give you an exceptional experience when you walk along the roads paved with colored stones and move among the refined but quaint inns to taste glutinous rice cakes called Baba, bacon, chickpea jelly and other special snacks. If you get lost, find a river and trace upwards. You will find the city entrance eventually. Naxi is the main ethnic group in Lijiang, and Naxi women are known for their ingenuity. On the southern side of Sifang Street is a tea house that Wang Hui frequently visits. There are ancient styled furnishings and a piece of calligraphy work hanging in an eye-catching position which reads: “Liquor is not indispensable for tea is also intoxicating, flowers are not needed for books bring me fragrance.” The tea house is owned and run in an easy manner by two girls from the Mu family. They have no fixed business hours, no intention for expansion, and often go traveling. They are no different from the other people in the city. Within the “Mu’s Mansion”, which is less than 50 meters away from the tea house, their ancestors once ruled this ancient city for many centuries. Old Town of Lijiang did not only serve as an important political and military stronghold in northwestern Yunnan, it was also the hub of economic and cultural exchanges between Han, Naxi, Tibetan and other nationalities. In ancient China, rulers would grant land and titles to minority leaders in the frontier regions and gave them the authority to rule the people. That is the “chieftain system.” The Mu family, as the leader of Naxi ethnic minority, was the chieftain of Lijiang. It is said that this Chinese surname “Mu” was bestowed by an emperor of the Ming Dynasty. The Mu family added a stroke to the Chinese character for “Mu” ( 木) to represent a hat on the head ( 禾), and also added another character“ 口”on the right to represent a basket in the hand. Therefore, the character “ 和”(He), which symbolizes farmers’ labor was formed and it was granted to people to use as their surname, which is still in use today. During the Yuan, Ming and Qing Dynasties, chieftains with surname Mu stabilized the frontier as ordered by the imperial court and engaged in massive construction projects. As a result, Mu’s Mansion, a chieftain office, was built in the center of the city. When you walk westward from Guanmenkou, you will find the Mu’s Mansion. As soon as you step in, spectacular chambers behind the screen wall will appear in front of you. A grand conference room, a library called Wanjuan Building, Hufa Hall, Yuyin Hall and other halls lined up for the chieftains to discuss governmental affairs, read and entertain themselves. Within the mansion, there are magnificent halls like those in the Forbidden City of Beijing, as well as rare plants that could be found only in Suzhou gardens. The chieftains who lived here “learned poetry and literature, and valued manners and morality”. 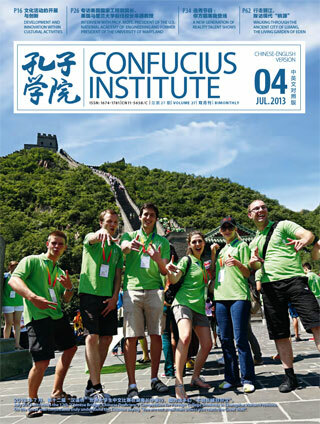 A Confucius-worshiping hall was specially built because of their reverence for Confucianism. 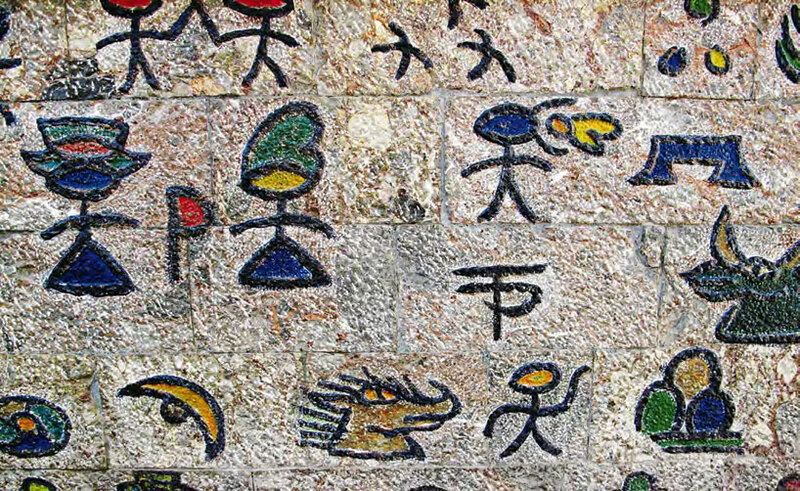 Dongba characters on stone walls. 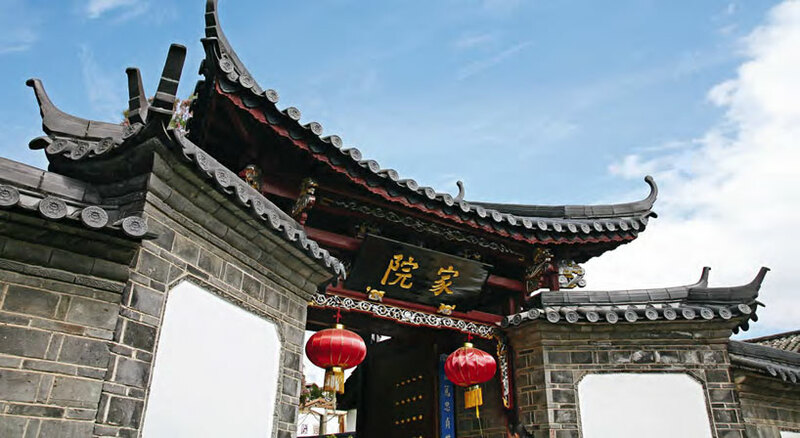 Upon stepping out of the Mu’s Mansion, one side of the monumental archway is inscribed with Chinese words, which are a transliteration for a Naxi sentence “Read your books now”. Among the chieftains in Yunnan, the Mu families were the earliest to accept Han culture and emphasize cultural education. On the other hand, they prescribed “Dongba is not allowed into the city”, therefore Dongba culture, which had been passed down for thousands of years, were shut out of the mansion. Dongba culture is in fact the Naxi ethnic culture, which includes painting, music, dance, worship and a variety of other contents. Among them, the most famous one of all is undoubtedly Dongba characters – one of the only two surviving hieroglyphics in the world. Tens of thousands of Dongba scriptures were written with over 1,400 simple but vivid characters that recorded the ancient wisdom of the Naxi people and they were included in the Memory of the World List. Decades ago, an American explorer named Rock came here and immediately devoted himself to the study of Dongba culture. From 1923 to 1935, he published a large number of reports in National Geographic to help more Westerners understand Old Town of Lijiang. Today, Dongba words are still alive in the streets of the city: road signs, signboards, clothing, and handicrafts …, like the unique symbols of an ancient city, they can be seen everywhere. Night fell and it began to drizzle. As lamps were lit at dusk, the city became shiny with colorful lights, endowing this ancient city with a sense of poetry. In a restaurant nearby the river, two people were sitting and dining face to face at the table. They talked quietly and smiled now and then. 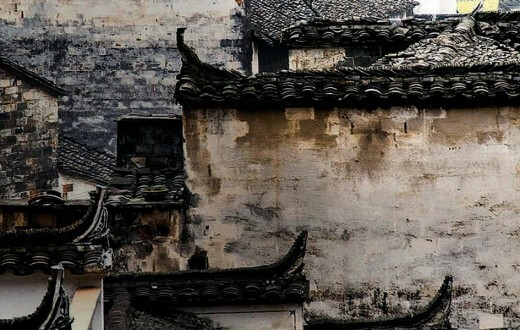 As time goes by, everything changes, but the passion for Old Town of Lijiang will be kept forever.